Who says a staycation can be overrated? Not a chance when this Master Bathroom retreat is where you could book your spa day! 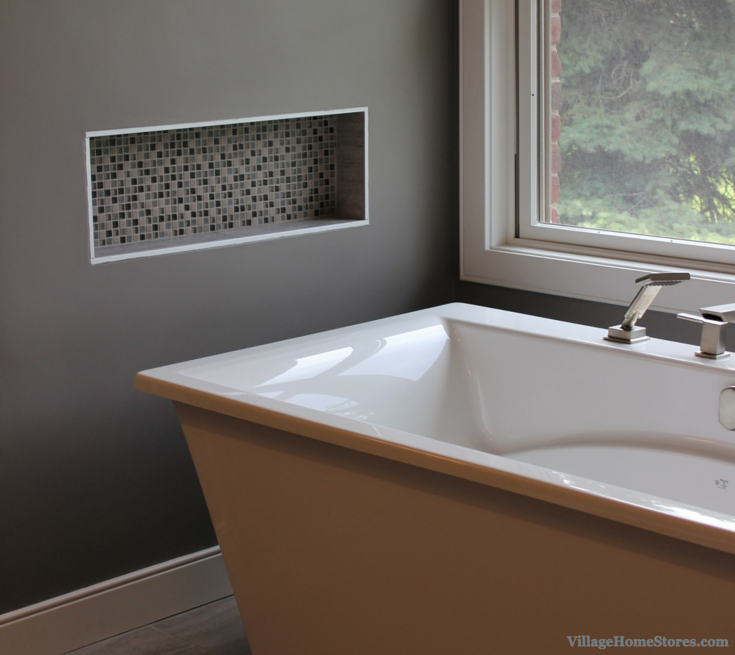 Watch a full video tour and learn in-depth insights into the products it includes in this episode of the Village Home Show. Press play below to watch. Medium oak cabinetry, trim and doors were replaced with a cool, serene collection of finishes. White doors and trim create a high contrast to the dark cherry cabinetry installed into this relaxing new spa getaway in Colona, IL. Giving the look of a high-end hotel but with all of the extra storage needed, there are two identical vanities in the new space. 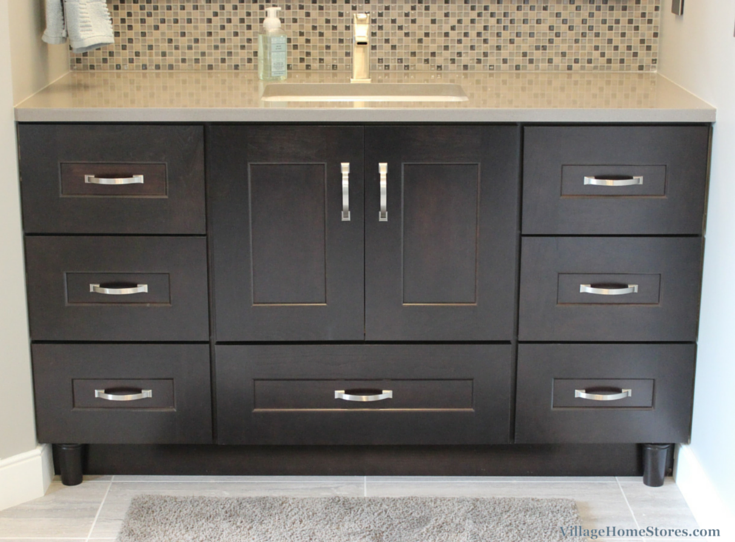 Storage below in the vanities allows for a cleaner look to be applied to the space above them. A framed mirror in place of a medicine cabinet mirrors back the vanity directly across from it as well as all of the light throughout the bath. 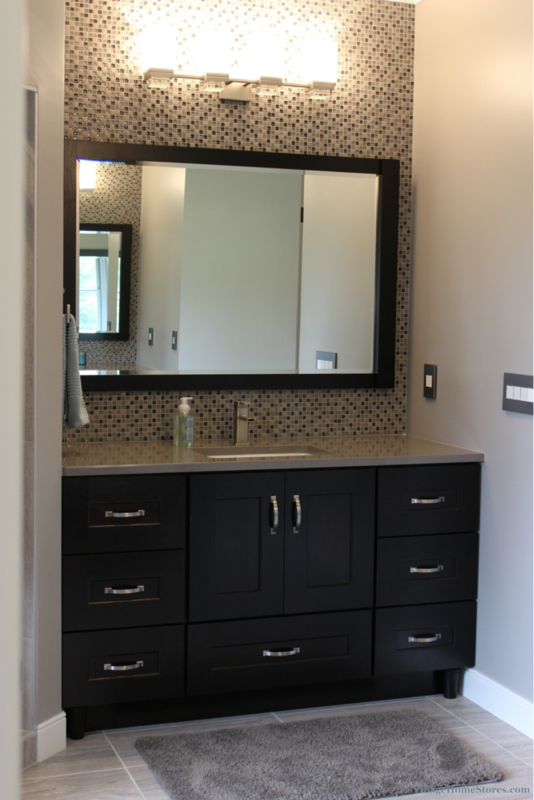 The Cabinetry and framed mirrors where custom ordered from our Dura Supreme Cabinetry line in a dark cherry stain. Brushed hardware and the addition of decorative feet to the toespace help set off this look. “Gray Expo” Silestone quartz countertops with undermounted white bowls perfectly compliment the surrounding tile selections. Let’s take a look at what other details went into creating this serene new space. You may have noticed that there are not any boring white wall switches distracting from this gorgeous new space. 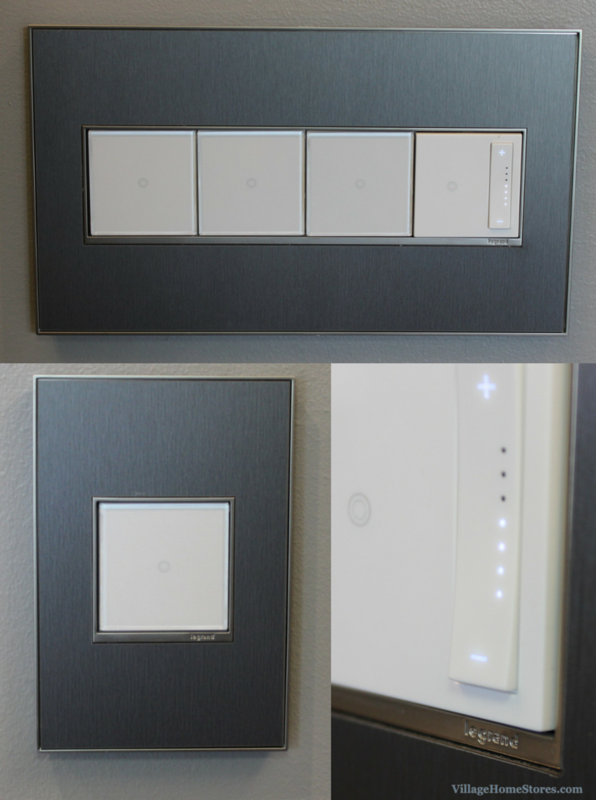 Our Adorne® series of switches and plugs have been installed throughout this new Master bath as well as the Master Bedroom just outside of it. This series allows you functions like pop-up outlets, wave-control switches and even U.S.B. charging stations all within a sleek square receptacle. Frame them in with one of their many plate choices or create your own custom wall plate. Get ready to start seeing more and more of our projects with these products they are truly amazing! An in-floor heating system has been installed beneath the new ceramic flooring. Cold bare feet are no match for this new cozy upgrade. What rests on these warm floor is the most inviting tub you could ask for. 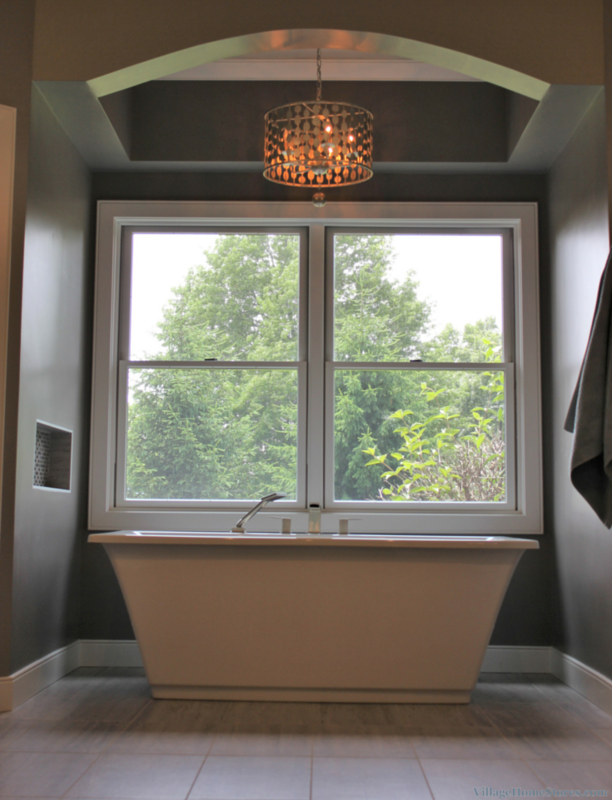 Your first view into this new space is of the new freestanding tub with an arched tray ceiling above. The previous tub dropped into a tiled platform and an oak apron filled this entire alcove. The same space is now open and outstanding! When you create such a perfectly framed space for a focal point you have to have just the right element to complete it. 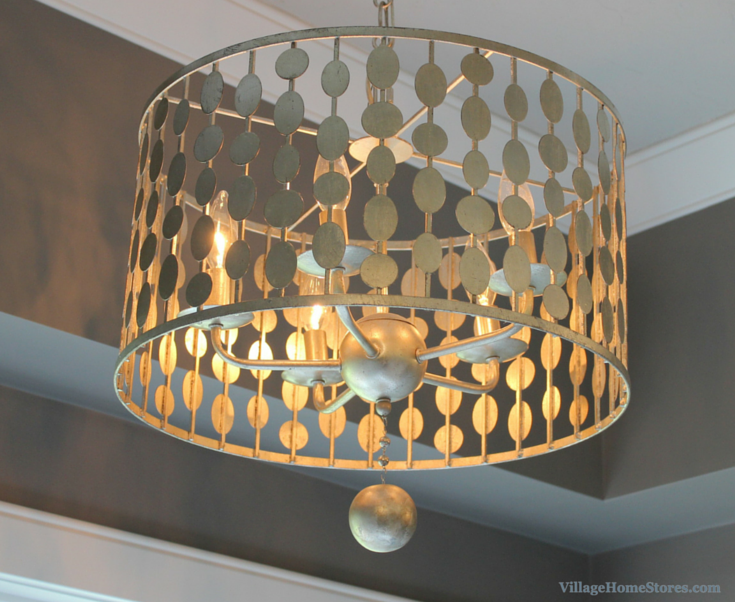 In this case it is the “Layla” hanging light fixture by Crystorama above the new tub. Always remember that if you have an idea you have seen somewhere online or in a magazine, our team is always eager to see what inspires you and help include those things into your own design. With a light like the one above the tub, it is better to compliment it than compete with it for the remaining lighting. Knowing the vanity lights would be mounted on the mosaic tile and be within sight of the tub fixture, these lights from Feiss were a great choice. the same mosaic tile was installed in the wall shelf near the tub as well as an accent in the new shower. If the tub is not where you will want to spend your time the new walk-in shower sure will be! If one showerhead just isn’t enough for you how about a rain showerhead above, a standard showerhead, and a handheld unit? This walk-in tiled shower includes a bench and built-in shelf for toiletries. 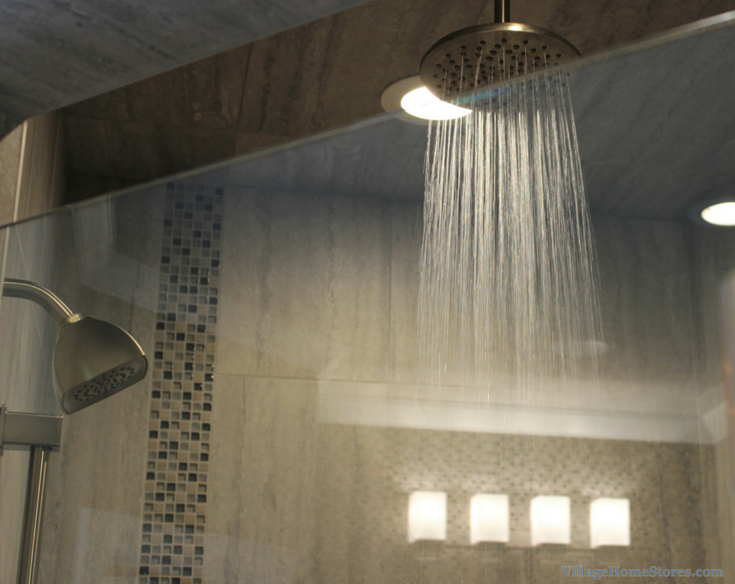 A rain shower head has also been installed above and can be used with or without the main shower unit. They each run on their own control system. Opposite the entrance to the walk-in shower is a private area for the stool in the Master Bath. 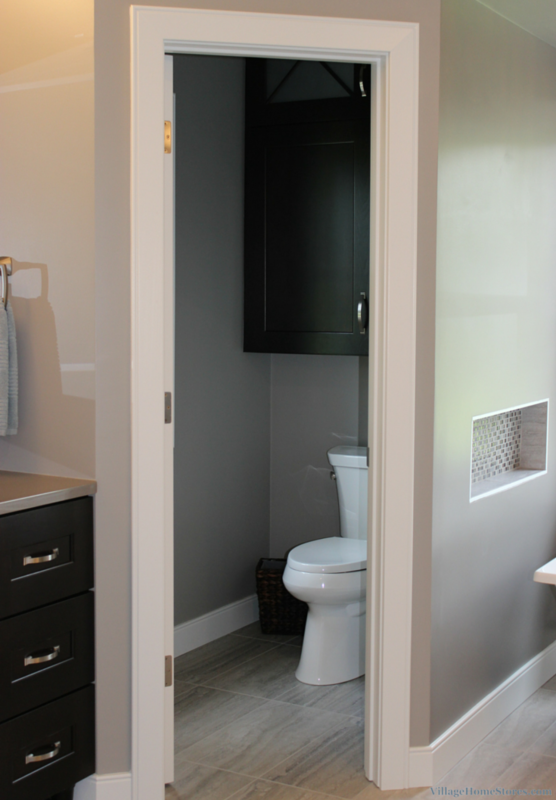 A custom toilet-topper wall cabinet was designed to house toiletries and extra linens in the wide space above the stool. Like many great things are, a gorgeous space gets that way because of the details. Just like the Adorne® collection gives the wall outlets and switches that added edge, details like crown molding can complete a look. The unique shape of this Master bath allows many locations for crown molding to draw attention to the room’s shape. 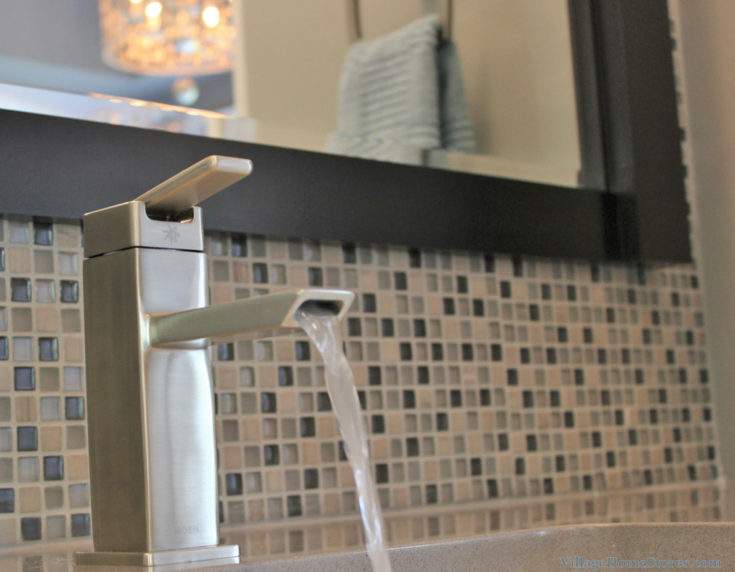 Other details like the waterfalling faucet fixtures all help create one cohesive and complete look. Many times bathroom projects can be difficult to visualize as you start to select materials you love. 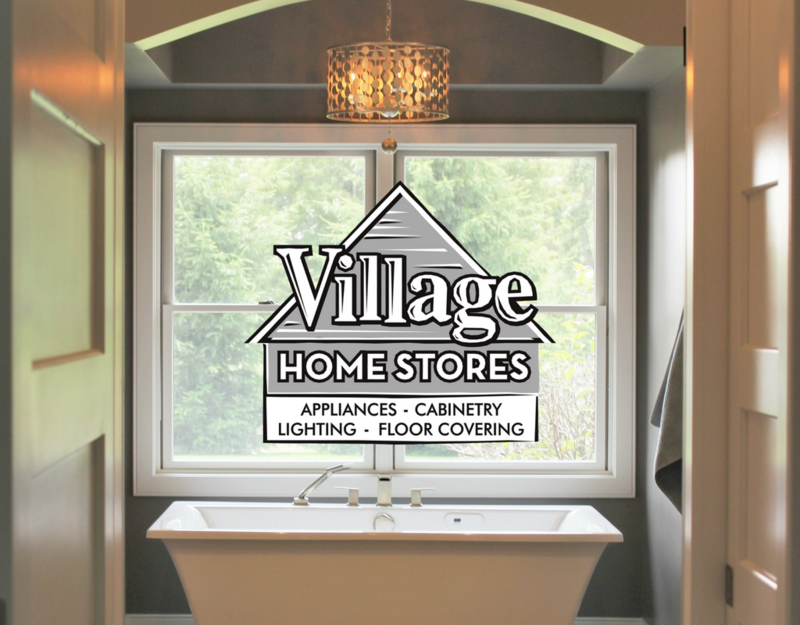 When you work with Village Home Stores we can help as little or as much as you would like. From start to finish, we are here. 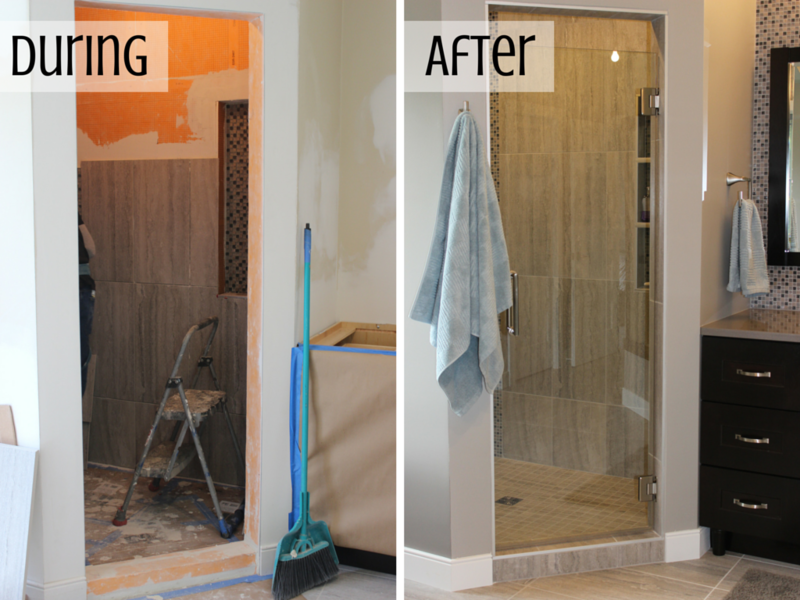 This Master Bathroom remodel was completed using our full project management program at Village Home Stores. 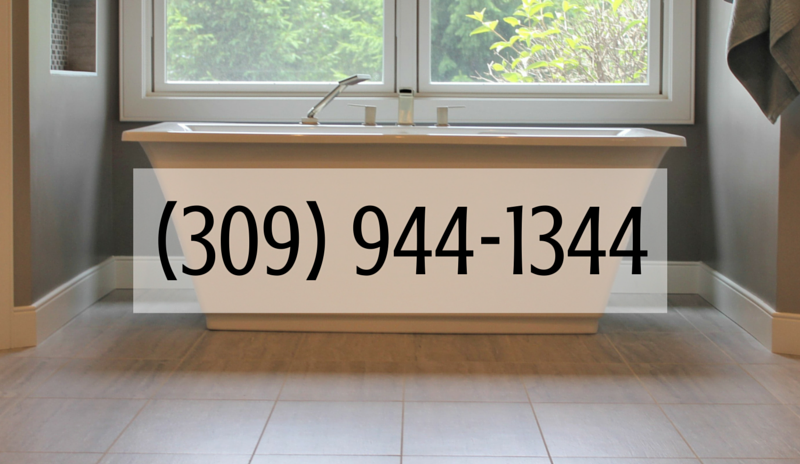 If you have been waiting to remodel a bathroom in your own home but didn’t know where to start or who to call first, we are here. Contact us today for an appointment and let’s start planning your own private spa retreat. Call us at (309) 944-1344 of just click here to request a member of our team to get in touch with you about what project you are wanting to begin. We can’t wait to hear what your own dream bathroom looks like. 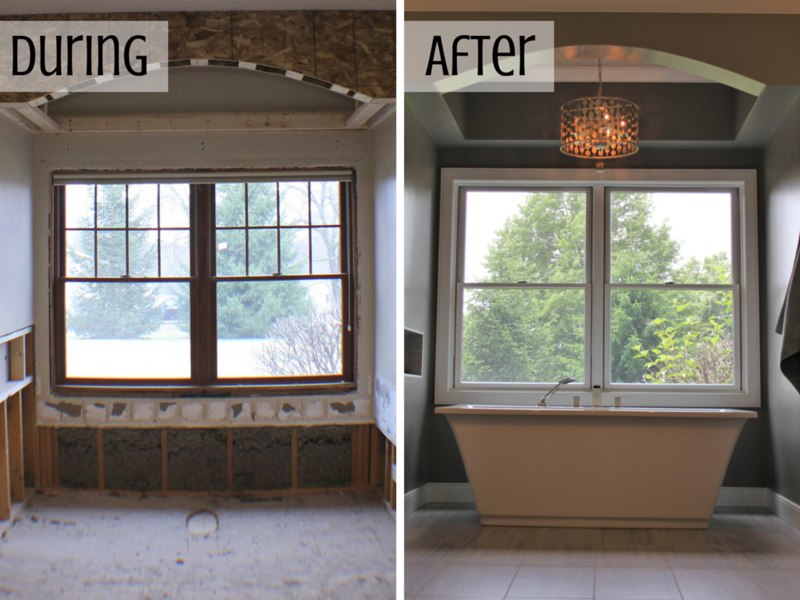 If it seems like we didn’t share the entire story here on the blog it is because this bath remodel was featured entirely on an episode of our TV show. See more of the Village Home Show here online!